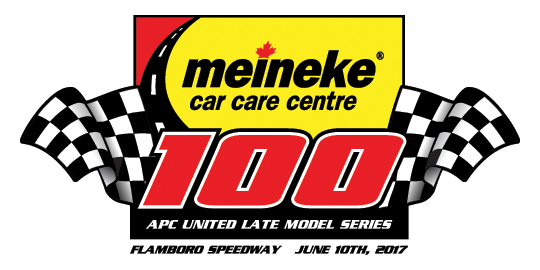 The APC series is proud to have Meineke Car Care Centre’s Canada return as the official event sponsor for the June 10th 2017 race at Flamboro Speedway, event number 2 on the 2017 schedule for the APC Series. Meineke sponsored last season’s Flamboro event and was eager to continue the partnership with the series and jump on board for the 2017 event. The 2016 Meineke 100 served as the season opener for the APC Series after a rainout a few weeks prior for the Sunset Speedway Event. The event was one of the quickest in series history, and ultimately Andrew Gresel would kick start his fantastic 2016 season by taking the win and parking the #81 in victory lane. Jamie Cox brought the #22 home 2nd, while 2015 tour champion Dale Shaw raced his family owned #83 to a 3rd. Meineke Car Care Centre’s specialize in full service for automobiles of all makes and models. Meineke opened its first Canadian location in 1981, and today they have over 950 locally owned and operated shops throughout North America. Also look for the Meineke sponsored car in the field June 10th as Shawn McGlynn was the first driver to re-register for the 2017 season and will once again pilot the #23 pro late model. The APC series is excited to have Meineke return as an official event sponsor for 2017 and look forward to the continued partnership.